M. Night Shyamalan appeared on the 'Late Show with Stephen Colbert' Jan. 15. 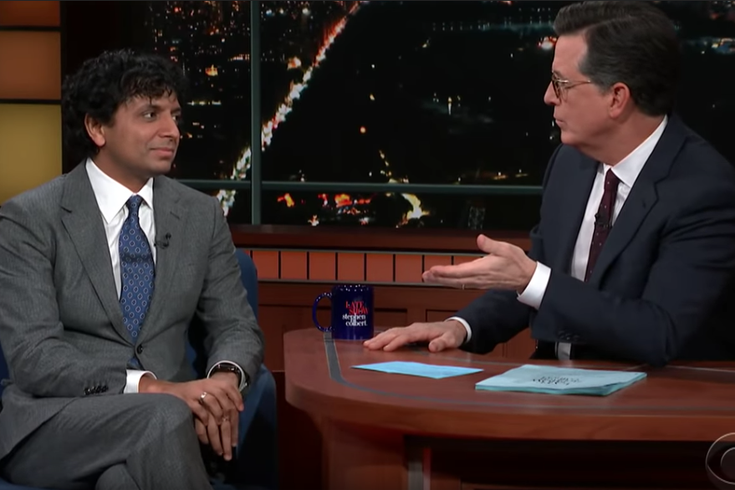 Promoting his new film, “Glass,” M. Night Shyamalan appeared on the “Late Show with Stephen Colbert” Tuesday night. Colbert welcomed the director and right off the bat asked him how he happened upon James McAvoy for the role in "Split" and "Glass." Shyamalan discussed his belief about the “universe” and says, “I have a theory about the way things work. The more specific we think about things the more things come back to you. Colbert asks what his parents, both doctors, thought of him moving into a career in film. “It would have been the equivalent if I would have said I wanted to start goth rock band.” Colbert asks if they were disappointed to which Shyamalan pointedly says, “Yes.” He then tells the story of his disappointed father not even acknowledging him when he told him he was going to film school.